Posted in News on March 25, 2015 by Race Clark. 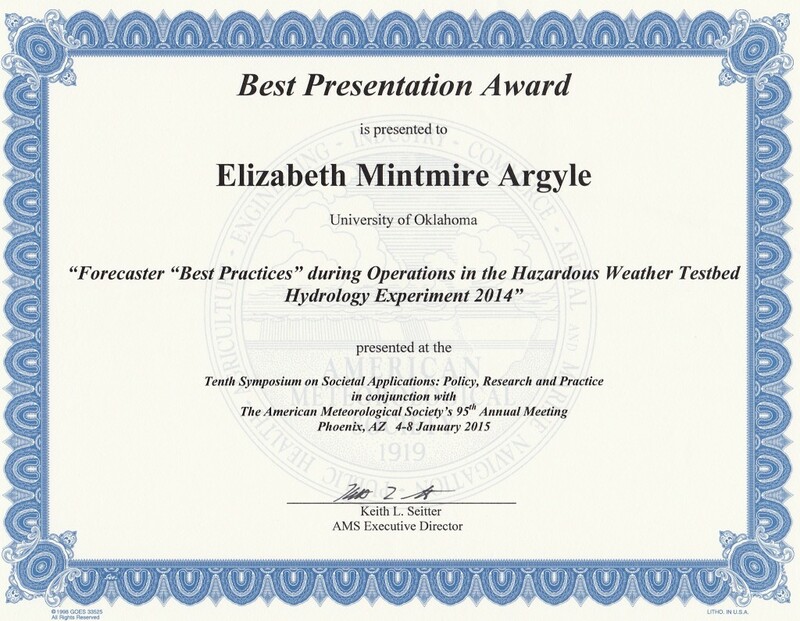 Elizabeth Mintmire Argyle received the Student Presentation Award from the 10th Symposium on Societal Applications, held as a part of the 2015 AMS Annual Meeting in Phoenix, AZ in January 2015, for her oral presentation “Forecaster ‘Best Practices’ During Operations in the Hazardous Weather Testbed Hydrology Experiment 2014.” As part of the recognition, Ms. Argyle received a $200 cash award and a certificate from the American Meteorological Society. Ms. Argyle works as a Graduate Research Assistant for the Cooperative Institute for Mesoscale Meteorological Studies at NOAA’s National Severe Storms Laboratory, in Norman, OK. She is also a PhD candidate in Industrial and Systems Engineering at the University of Oklahoma. Her PhD advisors are Dr. JJ Gourley (NOAA/NSSL), Dr. Ziho Kang (OU), and Dr. Randa Shehab (OU). Funding for Ms. Argyle’s research was provided by NOAA/OAR/Office of Weather and Air Quality (OWAQ) under the NOAA cooperative agreement, NA11OAR4320072.